Shella Fresh is a shop run by Bisk in Splatoon 2. It is found to the left of Inkopolis Square, in the center of Galleria. Shella Fresh is a shoe store owned by a spider crab named Bisk. It has guitar equipment strewn around, and there are shoe boxes everywhere. Some of the shoes are on shelves which appear to be skateboards suspended by some chains. 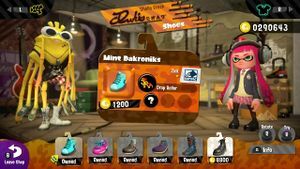 Shella Fresh sells shoes and boots that can be purchased with cash earned from multiplayer matches and Salmon Run. Players can tilt to rotate their Inkling and click to try on the highlighted item, and pressing purchases this item. Pressing displays further information about the selected item. Pressing zooms in on the player's legs, allowing for a closer look at the shoes. Pressing allows players to enter Ammo Knights and pressing similarly allows them to enter Ye Olde Cloth Shoppe, while pressing takes players back to Inkopolis Square. The inside of Shella Fresh, with the background unobscured. The name "Shella Fresh" is a play on the term "Hella Fresh". The guitar solo that plays in the middle of Bisk's version of "New You" is found in Sunken Scroll 6. Dūrakku "Do luck", probably from Kani Dōraku, a famous Japanese restaurant chain. This page was last edited on 28 February 2019, at 17:27.